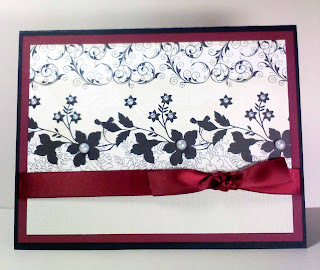 Here is a card I made for a friends wedding. The black and scarlet colored paper and the scarlet ribbon are from PTI, the designer paper and cream paper is from DCWV La Creme Stack. I added the pearls to the designer paper, they are from Basic Grey.